Don’t bother asking Agents Of Change for the location of their revolutionary Ghostvillage Project, because they couldn’t tell you even if they wanted to. A quick Google search reveals much of what the Agents themselves won’t or can’t reveal about the deserted Scottish town of Polphail. 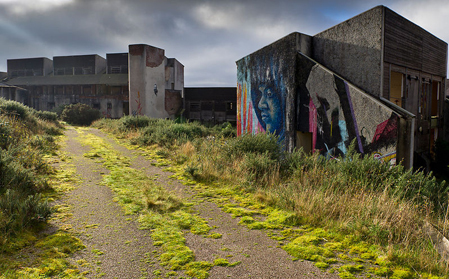 Once a fishing village and minor holiday destination, the area changed beyond all recognition in the 1970s with the construction of a series of concrete housing blocks to accommodate 500 workers from the planned oil rig at nearby Portavadie. The rig never materialised, the workers never arrived, and the brutalist, half completed structures of Polphail were left to the whims of wild animals, the eroding powers of weeds and offshore winds and the loathing of locals, who saw it as little more than a grand eyesore. Such attitudes weighed heavily on the minds of the Agents when they first came up with the idea of turning the derelict village into an enormous art installation. 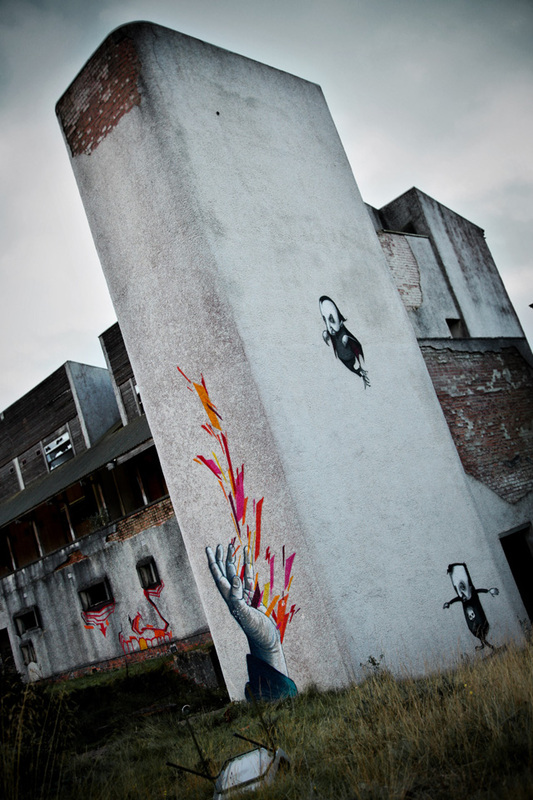 They travelled to Polphail in October 2009 armed with little more than ladders and helmets, spray cans and spotlights, and over the course of three days blasted surfaces with a wealth of crazed characters and abstract designs. What they left behind them was an ephemeral art gallery on a site that finally existed with a purpose, albeit not the one first intended. Without meaning to, Agents Of Change had created the work that best defined their beliefs regarding the transformative power of temporary art. A loose group of artists based everywhere from Brighton and Birmingham to Paris, Perth and Portland Oregon, the Agents evolved from graffiti crew Iconoclast in the early ’90s, and their street roots still clearly influence the way they approach a project. 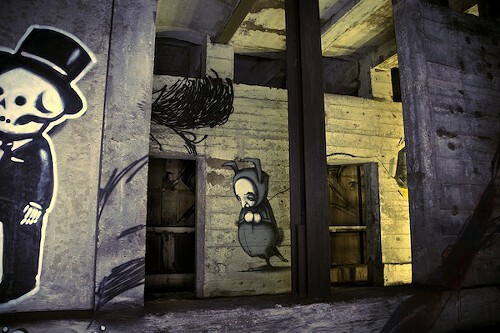 At the same time, there’s been a conscious evolution within Agents Of Change from the fundamental laws that founding member Remi sees as limiting graffiti’s ability to expand. As such, Agents Of Change are a long way from the traditional image of hooded teenagers stalking along suburban rail tracks under cover of dark, backpacks clinking with spray cans. None seem keen to define what it is that they stand for – a fear, perhaps, of creating a set of rules like those they spent so long escaping – but all agree that if there’s a formula at work, then it’s one as fluid and flexible as the art itself, constantly changing and adapting to the surfaces and situations that present themselves. Yet one element of graffiti culture the group remains guided by is an innate sense of mischief, and their faces light up with boyish glee when asked to describe their perfect projects. For Remi it would be a pop-up Soho art gallery, with road markings leading pedestrians on a walking tour between walls bombed with overnight artworks. Timid has a series of increasingly fantastic ideas, from painting the Australian salt flats or the tunnels under Las Vegas to a derelict island off Japan once used to house immigrants. And System, arguably the Agent most at the mercy of his graffiti background, giggles as he lays out a dream to turn Buckingham Palace into one giant artwork – a subject that soon draws the others into a discussion on the possibility of painting the queen’s London residence with beams of coloured light. And so another potential project is born, offering an insight into a creative process that is equal parts democracy, determination and cojones the size of demolition balls.